1. Heat 1 tbsp of the olive oil in a medium non-stick pan and brown the aubergine over a moderate heat for 10 minutes. Remove and set aside. Add the salmon cubes for 3-4 minutes until just cooked through. Remove from the pan. 2. Add the remaining olive oil to the pan, the chopped onion and celery and cook for 5 minutes. Add the tomatoes, some seasoning and the olives. Simmer for 10 minutes until you have a thick sauce. Add the aubergine, capers, vinegar and sugar and cook for 5 minutes until the aubergine is tender. 3. Stir in the salmon and leave to stand for 10 minutes. Spoon into bowls, scatter with the chopped parsley and drizzle with a little olive oil. Serve warm or cold with crusty bread and steamed green beans. 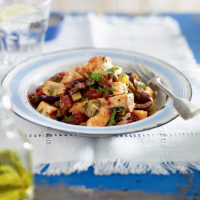 You can swap the salmon in this dish for tuna steak, trout or prawns. If you want to go veggie, this recipe can be made without the fish. Try a refreshing rosé to balance these light but complex flavours: Zalze Cabernet Sauvignon/ Shiraz Rosé 2010, Coastal Region, South Africa.